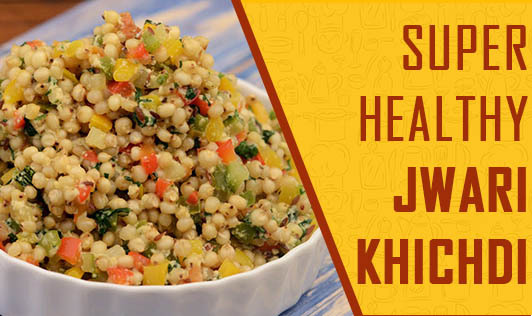 Rich in nutrients, antioxidants, protein, fiber, and iron, jwaari khichdi makes a wholesome one-dish meal. 1. Wash and soak the jowar overnight in enough water. 2. Drain the water and pressure cook it with ½ cup of water for 5 whistles. 3. Cool the pressure cooker. Once cool open the cooker and keep aside. Do not drain the excess water. 4. Heat the oil in a non-stick pan or kadai. 5. Add the cumin seeds and let it splutter. 6. Add the hing and sauté for a few seconds. 7. Now add all the vegetables and sauté on a medium flame for 1 to 2 minutes. 8. Add the cooked jowar with the water, and cook till the water dries up, while stirring occasionally. 9. Now stir in the milk and cook on medium flame for 2 to 3 minutes, while stirring occasionally. 10. Lastly, add the green chilies and salt, and cook on medium flame for 2 minutes, while stirring occasionally. 11. Garnish with fresh coriander.